"We met at church. Ben had just moved here from England. I remember the first time we saw each other...We didn't actually get to meet at first, but we kept catching each other staring. I thought he had such a kind face, and amazing blue eyes.... I hope our kids have those eyes!" Leading up to their wedding day, the weather forecast wasn't looking all that great. Oh, did I mention Ben and Elise's wedding was going to be outdoors? Yeah. Now, I've learnt after many outdoor weddings - there's not a whole lot we can do about Mother Nature, however the attitude of everyone even against some dicy weather is what makes all the difference. These two were no exception. During their ceremony under a tree it poured. And I mean poured with rain. But you know what? I've never seen so many joyful faces in my life. The guests all banded together, bringing and sharing umbrellas in an array of colours, and the ceremony carried on! And you know, I think the rain made it even better; it got everyone to huddle close together and built this beautiful atmosphere where everyone was in the same boat - and you could see it on their faces, which said, "You know, we might get a little wet, but we here to celebrate our buddies getting hitched! Bring it on rain!" Thankfully the downpour eased during post-ceremony photos, so we had a wonderful time capturing the new Mr. and Mrs. Williams under a light drizzle. 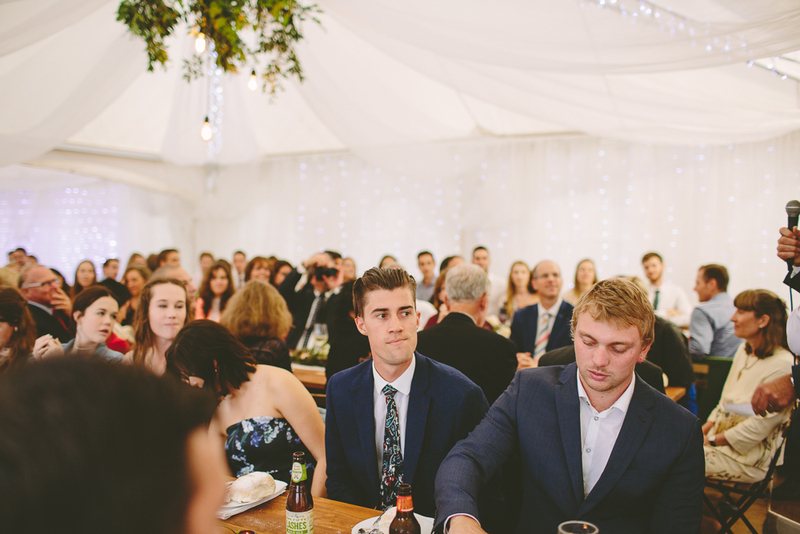 Ben and Elise proved that a spectacular outdoor wedding isn't about the perfect weather, it's about how you embrace it - even if it's as British as the groom!